The King of Pop’s legacy lives on in Michael Jackson’s Vision, a comprehensive collection of Michael Jackson produced short films that span his entire solo career. Breaker of the MTV color barrier as recently as 1983, the collection reminds audiences that Jackson’s musical genius was paired with an equal genius for the screen; Michael Jackson turned “music video” into art. The deluxe box set consists of 3 DVDs packed with over 40 videos boasting newly restored color and remastered audio. Films from such renowned directors as Spike Lee, John Landis, John Singleton and Martin Scorsese are included, plus 10 never-before-seen short films, the highlight of which is the video for the R. Kelly song “One More Chance.” Reflecting Jackson’s passion for music and its visual complement, this beautifully packaged box set features hundreds of vivid photographs and a mesmerizing holograph cover, where tiny MJs demonstrate quintessential moments in the star’s career. 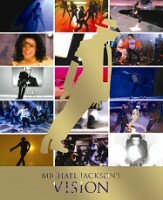 This is a terrific collectible for film lovers and Michael Jackson fans alike. This entry was posted in Popular, Rock, and Misc., Rhythm & Blues, Soul, Funk by aaamc. Bookmark the permalink.